On Monday I shared with you the questions that I ask myself to motivate myself to journal. I shared that I want to be someone who doesn’t avoid hard emotions. I want to be very clear about one thing: there is no shame in knowing yourself well enough to know that you’re not ready to face something. The point is that you know there’s something you’re not facing and you know you’re not ready to face it. You know. This knowledge lets you ask and answer the important question of: “What do I need to be able to face it?” Do I just need a good night’s sleep? Do I need to see a clinician? Maybe I need the support of my friends and family? If so, how can I get what I need or who can I ask for support and how can I ask for? What do you need that will help you face the tough stuff in life? On Monday I mentioned that I have a group of friends and family that I call my “support team”. While I’m sure you’ve guessed what this team is, I’ll go ahead and spell it out. My support team is a group of people whom I know I call upon from time to time to help support me through difficult times. 1. I have asked my support team to send me messages (texts, Facebook posts, tweets, emails, etc) on days or weeks when I know that I will need that extra boost that I can only get from interactions with my friends and family. Examples have been the day of a big test or the week of a long work trip. 2. I have asked my support team to help me edit my resume/cover letter and motivate me as I continue to look for a job or make career transitions. It can feel very humbling to ask for support. It can feel humiliating to ask for support. It can also feel good to ask for support. (I don’t want to solely focus on the negative.) However, one thing I have realized is that I always feel amazing when I get to help. By asking for help, you are providing the opportunity for someone else to get to be helpful. Plus, by asking for help, you know that they will be helpful in the way that you actually need. When you ask for help in a specific area, the other person no longer has to guess what would be helpful for you. So today, I encourage you to journal about who it is in your life that you can reach out to who you know will support you? What is going on in your life that you might want some extra support with? Can you ask for that support? 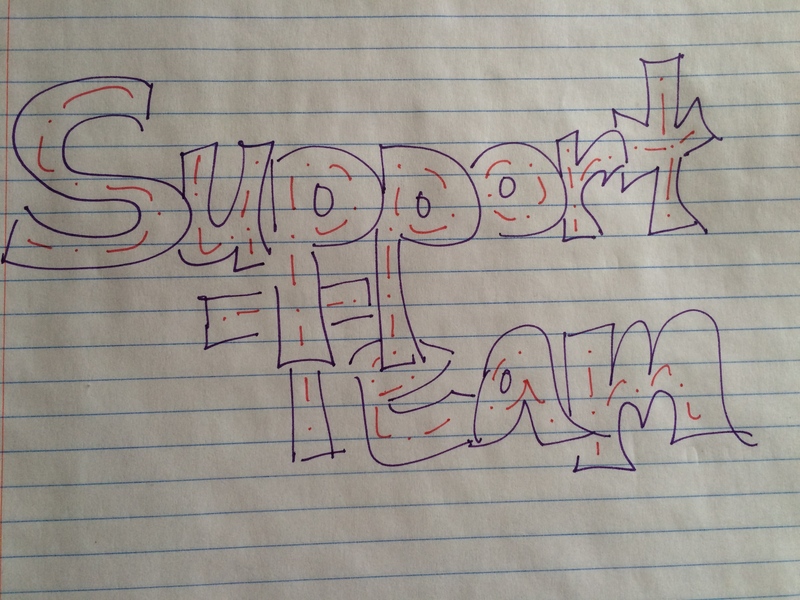 Then, if you have a need, go ask your team to support you while you see that those needs are met. One of my best friends and “support team members”, Dawn of www.mentalitywod.com, asked me what I do on those days that I just do not want to journal. You know those days: Those days when you slept through your alarm and you’re pretty sure you may still make it to work on time if you just cut the journaling out of your morning routine. Or those days when you intentionally skipped journaling in the morning with the intention of journaling before bed and now it’s bedtime and you’re pretty sure you’d rather sleep than journal. Or those days when you go to sit down and journal and say, “hello, old friend” to writer’s block and wouldn’t it just be easier to do anything else right now? Am I avoiding journaling because I’m avoiding facing myself or some strong emotion? If the answer is “No, I’m not avoiding anything”, then this probably means that life is relatively good. I’ve learned, through reading/analyzing my previous journals, that I tend to write less when life is relatively good. This may give me permission to take a day off. If the answer is, “Yes, I’m avoiding something” or “I don’t know…maybe…probably… leave me alone”, then I know I really need to be journaling. This motivates me to journal because I want to be someone who doesn’t avoid the hard emotions. Here’s reality, though: Sometimes, after answering this question, I quickly jot down my 5 things and still play the avoidance card. Sometimes, I get to the heart of what I wanted to avoid and I start the healing process. Occasionally, but less often than if I didn’t ask myself the question, I still don’t journal. So I ask you, what question(s) can you ask yourself which will motivate you to journal on those days where “you just don’t wanna”? Last Monday I wrote about what it means to be the villain in someone else’s story. Today’s journal prompt is to write a story where you are the villain. Maybe the story is a fictional story and you’re the “bad guy”. Give the villain, the “bad guy”, yourself, a back story. Why are you doing what you’re doing that is making you the “villain”? Think of the last argument you had where someone thought you were wrong (and you thought they were wrong). Write out the situation from their perspective. Why do people love Villains? Wow, am I uncomfortable with this thought! It makes me feel a little icky, if I’m fully honest with you. I don’t like being wrong. I don’t like to think of myself as the “bad gal”. I want everyone to know that I love them and would never want to hurt them. Yet, what if, despite all of that, I am still wrong? What if I have still caused lingering hurt? Darn it, I just know this must be true: I’m sure there’s someone for whom I have come out on the wrong side, whom I have hurt, for whom I am the “villain”. Yet, I think there is something special about this relationship. There is a part of me that wants to embrace this villain status. People love movie villains, right?!? Why is that? 1) I’m sure a huge part of parenthood (especially for those who have a teenager) is being comfortable being the “awful parent” who sets boundaries and punishes when those boundaries are ignored/blatantly crossed/forgotten. 2) This view of yourself (as the “bad guy/gal) works in opposition to another story character we might find ourselves often being: the victim. When we always find ourselves as the victim, we may inadvertently start to feel/believe that we have less control over the course of our own lives. We may start to miss some of the options that life offers us, or start to feel persecuted by having to “accept” less than favorable options. When we see ourselves as the “villain”, we can remind ourselves that we do have power. 3) This view of yourself (as the “bad guy/gal) works in opposition to another story character we might find ourselves often being: the hero. When we always find ourselves to be the hero, we may inadvertently start to feel/believe that we are always right. As the hero, our version of the story is always the most accurate, the most ethical, the most important. It’s also easy to slip from hero status to victim status and vice versa. When we see ourselves as the villain, it may help us see the perspective of another. It may help us truly see others, to acknowledge the reality of another. It stops us from being overly selfish and reminds us that the way another person understands reality is valid. In what relationships might you be the villain? Are there times in your past that you can see now that maybe you were on the wrong side? In what areas of your life might you learn something new if you think about yourself as the villain instead of a victim or hero? Much like last week’s exercise, I encourage you to catalog your “selves” in the following chart. This week, however, instead of starting with the self, start with the situation. Then choose what self you wish would “show up” for that situation. The second row, shown in purple, is an example from my chart. Personal Finances “Work Self” Ability to set goals and save money, more frugal spending I’m not the ultimate say at home – can’t get mad at my husband for his spending needs. You may find that there are some situations the best “self” is the one that already tends to be the one you use. If so, great! For those areas where it’s not your default “self”, now you have an idea of “who” you need. “Onward” is a book about Howard Schultz and his deep relationship with the company he founded, Starbucks. This book focuses on the time in Starbuck’s history when Howard Schultz returned to the CEO position and his experience of being in charge while the company slogged through the latest financial depression in the United States. This book seeks to explain the controversial and life-disrupting decisions the company made when it chose to downsize both in store number and employee number and the leadership and training decisions that were made during this time. When I read the book through the lens that this was primarily a book about Howard Schultz at work, I loved the book. I felt pain when Howard Schultz felt pain. I felt joy when Howard Schultz felt joy. I was uplifted when Howard Schultz was uplifted and I was made to feel small when Howard Schultz was made to feel small. Through this lens, this book is an interesting case study in the relationship between a founder and the company that is founded. He talks about branding, balance, relationships, the pressures associates to being the one who has take responsibility for both the good and the ill, the roles of mentors, what it means to stay the course, and how easy success can be blinding. What I appreciated most about “Onward” is that it is a book about a never ending process. Starbuck’s is working to establish what it means to be an ethical company and maintain that ethical status. Howard Schultz doesn’t see his company as a means to a particular end, but as a company that is striving for ethical sustainability. My biggest complaint about the book is when Howard Schultz continually explains that he is able to recruit major talent or promote from within primarily through his own “gut feeling”. He uses psychology and analysis in so many other places in the book, why couldn’t he do that on this topic? When I read the book as though it is primarily about a company, I experienced discomfort. Starbucks is a company. It is not a person. At the end of the day, in order to survive in a capitalistic society, Starbucks must make money. This means that Starbucks can provide health benefits to all the part-time employees, but it can also still do what almost all other companies are doing and cap that benefit as starting at 32 hours a week and then save costs by not having employees work that many hours each week. This means that without the right person sitting at the helm of the company the next time that a Starbucks board member of a financial analyst suggests cutting those benefits to help save costs (which happened more than once in the book), this company may bend to the pressure to do just that. When read through this lens, the argument could be made that “Starbucks” is too big to fail. Overall, “Onward” is a quick and enjoyable read. Whether you enjoy a cup of Starbuck’s coffee or see them as the Goliath of the coffee world, I encourage you to read this book and see how it can influence you to continue “Onward”. In my last Monday post, I discussed one way that we share our own realities – through the use of the “self” that is guiding how we take in information. This week, I want to talk about that same concept, but with a small shift. I want to talk about trying to choose which “self” we use in a given situation. Last Wednesday, I asked you to use a chart I created to catalog your different “selves”. I asked you to catalog the pros and cons of each “self” and to say what situations you find you are most likely to find that “self” in use. This week, I want to encourage you to journal about what would happen if you used a different “self” for one problematic area of your life. Here’s an example from my life: My work self is pretty darn good at money. I don’t overspend on office supplies (which I happen to personally love). I don’t buy cheaply made things, but I don’t spend on expensive item that probably aren’t of much higher quality than Maybe it’s that I see the money as belonging to someone else. However, this has not often carried over to my home life. In my home life, I often feel unable to handle my spending. There are a lot of reasons for this, but when I started to think about applying my “work self” to my home life, I realized that I can control my spending. I already do it in one aspect of my life. It may not be as natural in my other “selves” but the capability lies within me. So look at the graph you created last week. Look at the pro and con lists. Are there places where one self is a pro in the same arena that another self has difficulties? If so, then you have already within you what you need to change some of the difficulties in your reality. As today’s journaling activity, I encourage you to catalog your “selves” in the following chart. The second row, shown in purple, is an example from my chart. Don’t be alarmed if you have to use more than one sheet of this chart. The act of journaling is an act of self-reflection. This act of self-reflection alters your reality. Thus, journaling is an act of reality-shaping. This blog has discussed just a few of the “people” inside of you who combined create “you”. This blog has asked you to start listing those people, describing them, determining their usefulness, their origins. It has asked you to be intentional and mindful about naming and claiming the different parts of your “self”. I’ve asked you to do this because journaling is a form of address. Your existence is a little less precarious when you start to recognize the ways in which you have learned to address yourself and can start to make changes. Scenario 1) Most of us have a less-than-accurate-and-usually-just-mean inner self-critic. If this voice is not recognized for what it is, it can be the voice that defines our existence. Every negative thing that someone says becomes a confirmation of this voice. Your boss critiques the way you handled a crisis = your self-critic is accurate. Your child doesn’t listen when you say “no” = your inner-critic is accurate. You forget to pick up the milk on your way home = your inner-critic is accurate. Scenario 2) I have learned through my journaling that I often address myself as someone who is continually striving for progress. I struggle with this form of address because, philosophically speaking, I see value in this type of address. However, I have learned that if I’m not careful, this way of addressing myself can have negative effects. This negative aspect looks a little like this: When someone (usually my husband) points to one of my flaws (which could simply be a wrong answer on a trivia question), if I’ve been letting my focus on progress define me, then anything that questions that progress becomes “the enemy”. My defenses go up and I snap at my husband. In both of these scenarios, the form of address that we become accustomed to within ourselves becomes the way in which we interact with those around us. This is how the way in which we address ourselves shapes our reality.